Set up beautifully in 1940’s New York and based on a true story, Florence Foster Jenkins tells the story of a truly awful singer (Meryl Streep), completely enveloped in her oddly closed world of a 1944 New York hotel. Pampered by her unsuccessful actor/husband St Clair Mayfield (Hugh Grant), a term we find out to use loosely as he is otherwise occupied in a completely different residence with his long-time girlfriend Kathleen (Rebecca Ferguson). Together with ex-actor Mayfield, the wealthy Florence is the co-star of the show at her self-owned “Verdi Club” where she has a non-speaking role enacting various ‘tableau’ scenes. But in the interests of following her dreams, she recruits the help of famous singing instructor Carlo Edwards (David Haig) and an enthusiastic, personable young pianist Cosme McMoon (Simon Helberg). Carlo becomes aware of what he is in for once she actually starts to “sing”, which is more like a cackling hen than an actual singing voice and starts to see how she has been deceived her entire life by the people who surround her, into thinking she is something she is not. This film got on my nerves fairly early in the game and gradually got worse as it went along. Meryl Streep seems to just be coasting and going through the motions in her career right now, this being no exception to the rule. And while Hugh Grant is often quite unfairly criticized for playing Hugh Grant in every movie, here he actually turns a somewhat decent performance as once again though, a cad. Simon Helberg’s character is the most funny, for a bit, and gradually the quirkyness you thought funny for the first 20 minutes, grinds on you. 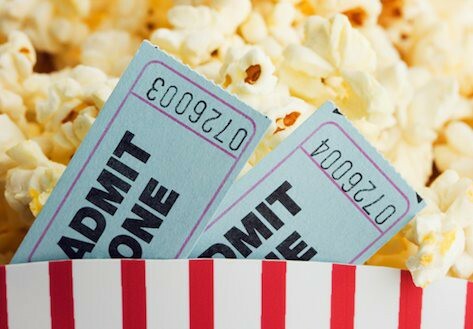 While the film is not without it’s charm at points, it fell a little short for me on storyline. The acting was adequate, but I felt like we never really got to know or understand why it had gotten to the point it did on her life. I wanted just a touch more backstory. All in all, I can only recommend it to a certain niche of viewers as I’m sure some will find this a somewhat likable film. 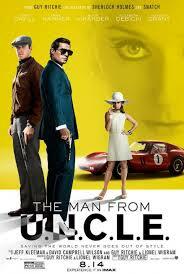 Director Guy Ritchie starts off with a wonderful, very highly stylized car chase. From that moment on I pinned my hopes that the whole film would be just as good as this sequence. It ends up turning into rather a bumpy ride between plot highs..and plot lows..making it an overall fun, but uneven film. 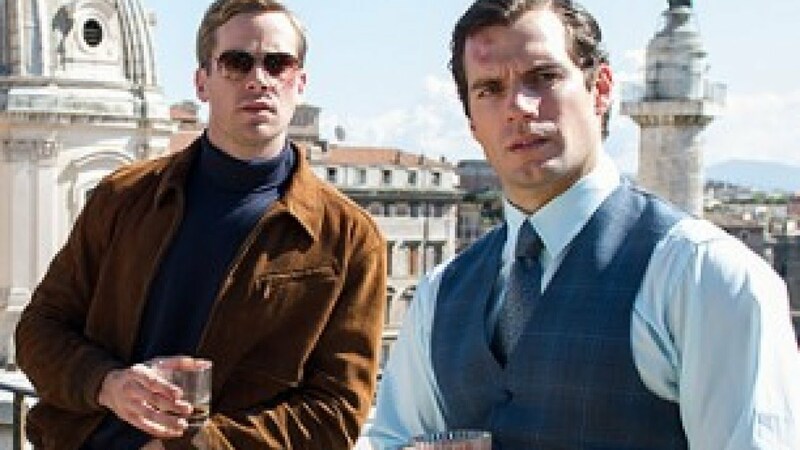 Henry Cavill as ‘Napoleon Solo’ and Armie Hammer as ‘Illya Kuryakin‘ are the dymanic spy duo coming from differing enemy camps – Solo being from the CIA and Kuryakin respectively, the KGB, who must work together along with help from German/car whiz girl mechanic/possible double agent (maybe even triple we’re not sure) ‘Gaby Teller’ (Alicia Vikander) to battle the forces of mysterious and evil criminal organization – The Vinciguerra Empire – a rogue Italian group of ex-Nazi loyalists ran by “Victoria Vinciguerra” (Elizabeth Delbecki) & her husband “Alexander” (Luca Calvani). The goal is to uncover the plot to stop them from obtaining and detonating a nuclear bomb. Following a fairly standard formula for spy plots that involves good guys vs. bad guys to save the world, here Ritchie throws intrigue to the back burner and instead ramps up the charm and personality of his characters. 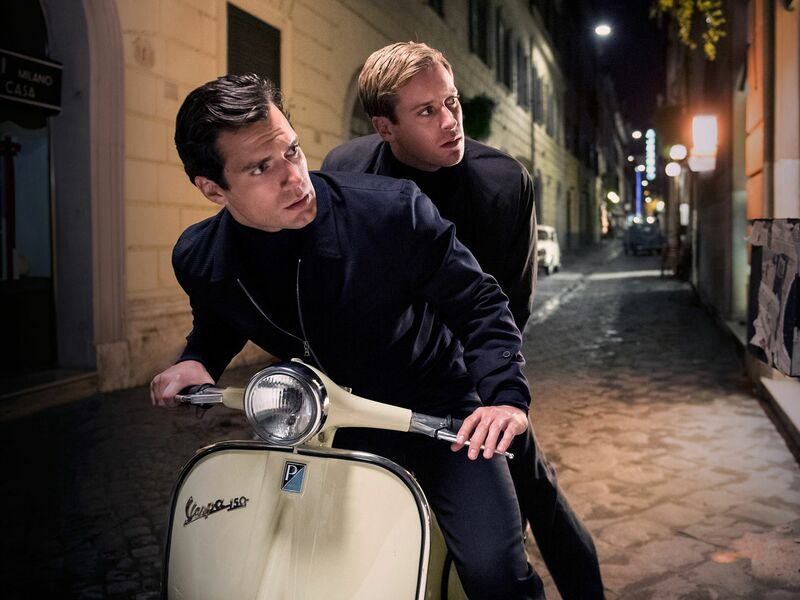 Each one has their own unique set of traits which set them apart, yet it also brings them perfectly together to create the type of “spy team” with palpable chemistry that works all the way around and delivers to us a most entertaining ride. Add in the always witty and charming delivery of Hugh Grant, Jared Harris and Misha Kuznetsov in their respective roles as head of differing agencies and you can’t beat the overall fun that they dish out. As with any film of this genre, my motto of ‘your only as good as your villains’ once again applies as I did find those being the only characters the lacking the charm and chemistry of their counterparts, though still stylish, just missing what is truly needed to a baddie, the ability to still like them even though they are the villains. Ending with the perfect setup for a sequel, I do hope the wonderful stylization remains as do the characters, though with a bit better plot and new villains as it could prove that a sequel might even turn out to be better than an original.